Rudy Therassan headed Haitian national police from 2001 until 2003. He was accused by U.S. Drug Enforcement Administration of protecting Colombian cocaine shipments.He was sentenced to almost 15 years in prison and obligated to also forfeit $1.8 million in assets. 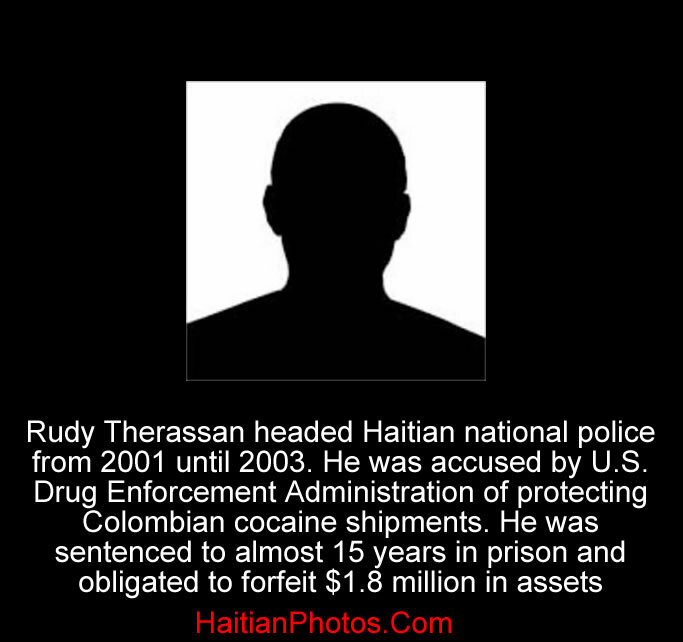 In May 2004, Rudy Therassan, Haiti's former National Police Chief (from April 2001 until approximately August 2003) was accused of allegedly taking money from a Colombian drug dealer to protect cocaine shipments passing through Haiti on the way to the United States. In April, 2004, in a U.S. federal court, Therassan pleaded guilty of conspiring to import at least 10 kilograms (22 pounds) of cocaine into the U.S and activities amounting to money laundering. Therassan used to receive $150,000 in cash for each plane-load of cocaine, he allowed to land on Haiti's Route 9, which were subsequently smuggled to the U.S. His $1.8 million in assets, including two houses in Palm Beach County, Florida were forfeited by court order. During his trial, one informant testified that he witnessed Therassan shoot and killed Haitian drug trafficker Hector Ketant's brother and his bodyguard after a dispute over money.